If you’re looking for a high-quality baby swing to purchase for your infant son or daughter, then the Fisher-Price Snugabunny Cradle ‘N Swing is the just right option for you. To learn about everything that this swing has to offer, here is an in-depth review of this top-rated baby gear selection. The reason why this swing is such a quality buy is due to the fact that it has all kinds of features, which result in a lot of benefits for the parents, caregivers, and infants who ultimately use it. A plush seating area with a seat cover that can be machine washed. Seat reclines in two positions and can adjust between right facing, center, and left facing. Body insert and bunny ears head support. Two swinging motions: Back and forth and a side to side. SmartSwing Technology with six different swinging speeds. 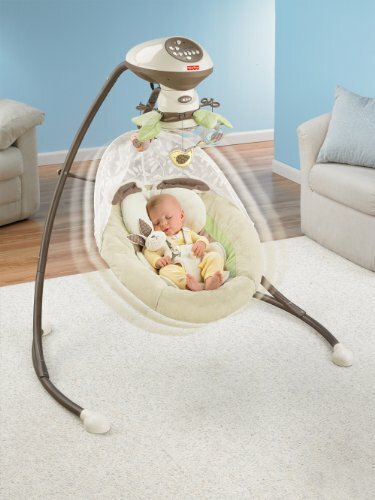 The swing actually senses your baby’s weight and adjusts the swinging speed accordingly. Comes with a mobile that features flying birdies. Plays 16 songs and nature sounds. Has a lovely neutral toned color scheme of soft greens, cream tones, and bold browns. Can be run on batteries (4 D batteries) or a 120-volt adapter. As just pointed out, the Snugabunny Cradle ‘N Swing has a lot of features and they lead to a slew of benefits. Providing a child with a comfy place to lounge, relax, and sleep. Soothes a baby with its different swinging motions, especially the side to side motion that simulates a child being rocked back and forth in his or her mother’s arms. Keeps an older infant entertained thanks to its multiple songs, nature sounds, and overhead mobile. Offers parents and caregivers a safe spot to place a child if he or she needs to do something quickly around the house. Just like with all things that you can buy, whether it be equipment for babies, new shoes, or appliances, there are always pros and cons associated with them. And, the same can be said for this swing. Is safe and sturdy since it has such a large base and footprint. Although it has a lot of moving parts, rather easy to set up. Can be used by a child for quite some time since its full body safety harness is adjustable. Its SmartSwing technology ensures that a baby is never rocked too fast or too slow, making it easy for mom or dad to make things comfortable for his or her baby. One of the most expensive swings on the market. Requires a lot of space to use. Also requires a lot of power to operate. Parents like how the swing was very, very easy to use and commented that they liked how the swing didn’t need to be started with a push. The ability to change between using a power supply and cord and batteries to power the swing was something that people found to be very, very convenient. One thing that a lot of parents and caregivers didn’t particularly like about the swing was that it was rather large, as touched upon in the cons section of this review, and they also didn’t like how it wasn’t all that easy to move. Figure out how much space you have where you’ll put the swing, so it will be able to fully swing from side to side. Estimate how much you plan to use the swing so you don’t over or under buy. Avoid the temptation to be impulsive due to the fact that impulsive purchases lead to dissatisfaction later on. As you can see from reading this review, the Fischer-Price Snugabunny Cradle ‘N Swing is a high-quality baby gear option. So, if you were on the fence before about purchasing it, don’t be because, despite the high price tag, it’s well worth the money. Now, don’t delay, and get one today. You’ll be happy that you did when it’s in place, gently rocking your child into a peaceful slumber.